The 4th Greek Championship main event is beginning shortly. Aris1970 and Great Manos are the only players left unscathed on 4/4, and they play tomorrow morning on R5. Slightly brehind them are OVERLORD and roeczak with 3.5/4 (they drew against each other) followed by a bunch of other players at 3/4 including : pasxalistz , zoografos, GrShark, hellinon, Henry, FGP_. Good luck to all players and may the best win. Looking forward to meet and play the best Greek players in The Netherlands this summer. Congratulations to OVERLORD for his 3rd Greek Championship and to the silver and bronze medalists zoografos and roeczak respectively. Also, for those still dubious about GrShark, this is the real-life proof of his high level. Edited by The Achaean, 22 April 2018 - 07:21 PM. Congrats on Overlord! How many titles did you win already, John? Also great performance of Zoografos and Roeczak! Very nice number of people also, keep up the good work! Hi all! Congratulations to all players and also to the organisers for that great championship. Thank you all for your nice words. 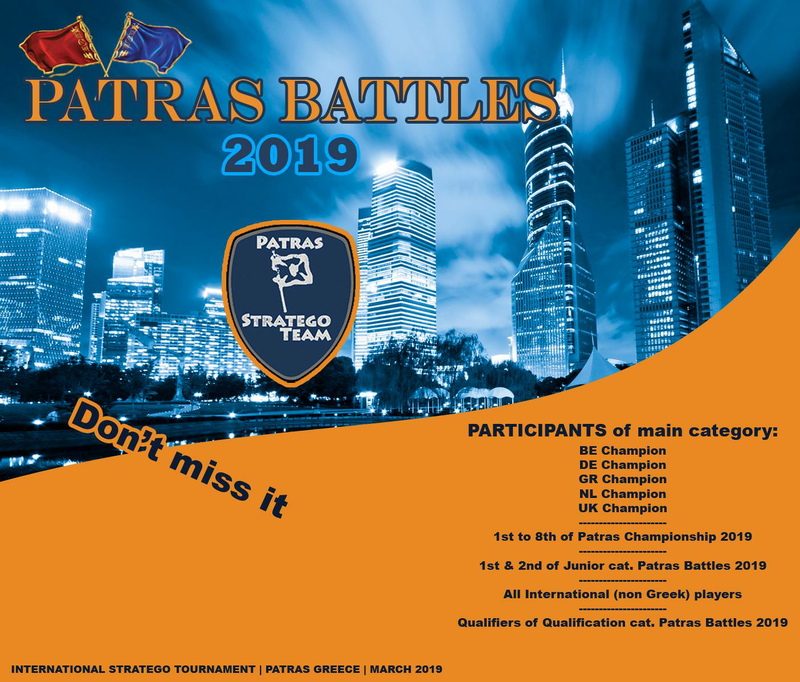 Get prepaired for ....Patras Battles 2019 !!!! 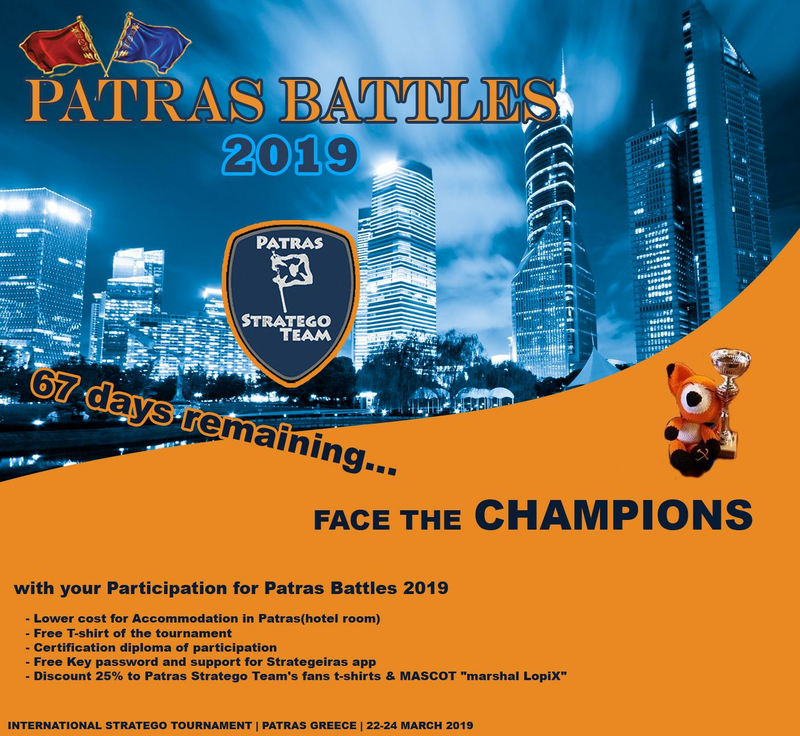 *The last Champions from Belgium, Germany, Greece, the Netherlands and United Kingdom will get an invitation to participate in Patras Battles 2019. The benefits of that invitation will announced shortly. Edited by dalee, 17 October 2018 - 09:26 AM. The greek bronze medalist( ) will surely be there !!! ... what about Swiss champion? Edited by Napoleon 1er, 30 October 2018 - 07:13 PM. Year to year the invitations will be increasing. It it about the matter of the budget. Also we have the hope that Switzerland and USA will increase the number of their players and the impact to worldwide, at the near future. 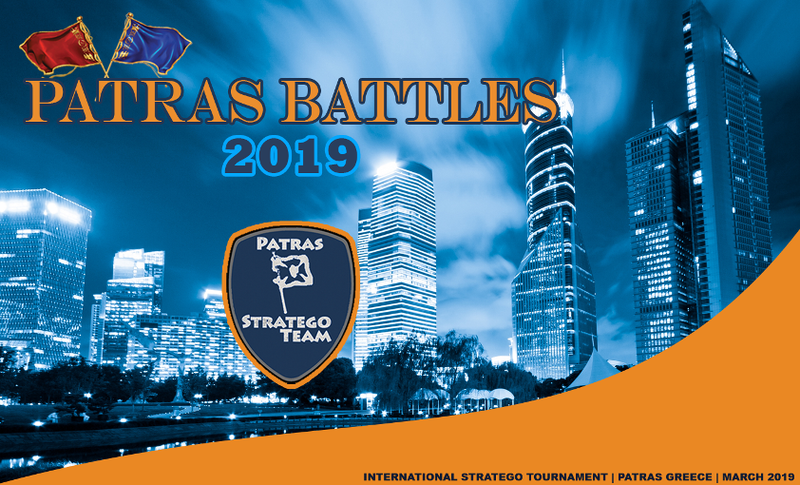 Although, It will be very pleasant, if you were present as participant players to Patras Battles 2019! Edited by dalee, 30 October 2018 - 10:13 PM. Edited by dalee, 07 November 2018 - 01:04 PM. 103 days before the International Patras Battles tournament and the players' interest to participate is enthusiastic. 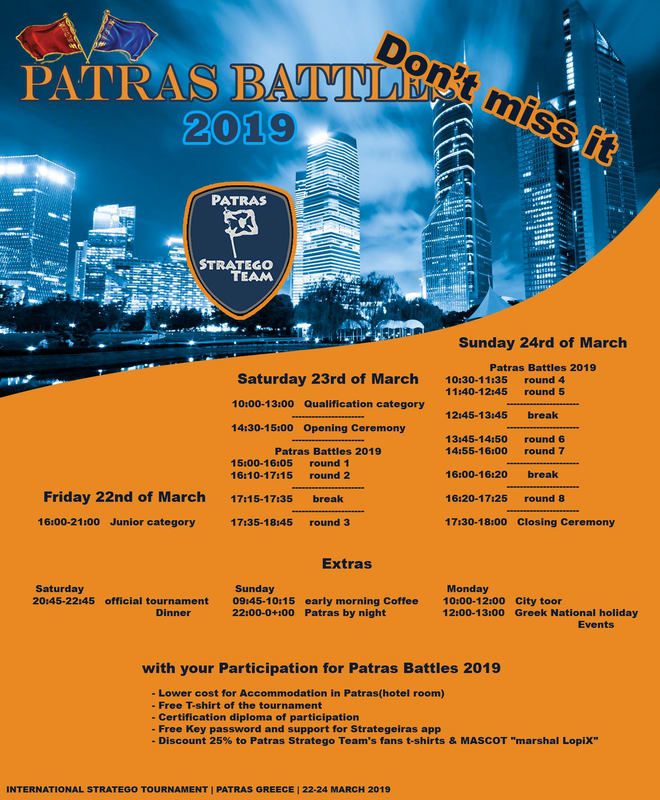 Except for the invited champions, known players from Greece, the Netherlands, Belgium, England and USA looking for infos, to be on that meeting in Patras!